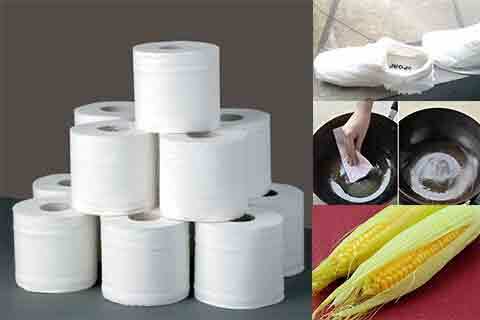 Tissue is quite common used in our daily life. Today I would like to tell everyone some imaginative and creative tissue paper usage, and I hope these tips can make your life more colorful and interesting. Usage 1: Keep the white fabric shoes clean as new. Do you like wear white shoes? Have you ever been bothered that it is too hard to clean the white shoes? Here is the first tip of tissue paper usage to handle this solution. After you wash your shoes, wrap the white part in tissue. When the shoes dry, just take off tissue, the fabric shoes will be clean and white as new! Usage 2.Remove the corn ears Sometimes it’s too hard to remove the corn ears. You can use a wet tissue for containing the corn, and then you can remove the corn ears easily. That’s the second usage of tissue paper. Usage 3: Keep iron pan far away from rusting. When we use a iron pan for cooking, sometimes it will rust. That’s because iron is easily to rust when it contact with water. Here comes the third usage of tissue paper. After clean the iron pan, use tissue to wipe it and stack up dry tissue, because of tissue’s water-absorbing quality, the iron pan is not easy to rust. 4.Odor removal and freshen up. Roll paper is always put in the bathroom. While do you know it can fresh the room? Lavender essential oil is quite common and not expensive. Drip a few drops of it on the tissue and just put it on the bathroom. The whole room will be very fresh and aromatic. Tissue is a common necessity in our daily life. There are lots of other usages of it. It’s so convenient, cheap and fine. While we should not waste tissue since it is made by wood, so we can protect environment when we save it.